Due to heavy rioting and protests, Port-au-Prince and surrounding areas that include St. Damien Pediatric Hospital have been on lockdown since February 7, 2019. Since then, St. Damien has been functioning in emergency mode, with the managing staff being present at all times to coordinate activities and keep the hospital open and functioning 24/7. Less than 1,000 miles from the U.S., Haiti is the poorest country in the Western Hemisphere. ….and survive on less than $2 a day. • 138,000 children die of preventable diseases each year. • One out of four children is moderately to severely malnourished. • The current Cholera epidemic has caused 8,000 deaths. NPH USA is helping transform thousands of lives through the support of Nuestros Pequeños Hermanos/Nos Petit Frères et Soeurs (NPH/NPFS Spanish and French for “Our Little Brothers and Sisters”). Since 1987, NPH/NPFS has operated the St. Helene home in Haiti for orphaned and abandoned children. While the initial goal of NPFS was to build this permanent home, the large number of children dying from treatable illnesses showed a desperate need for a hospital that could treat chronic and other debilitating pediatric illnesses. 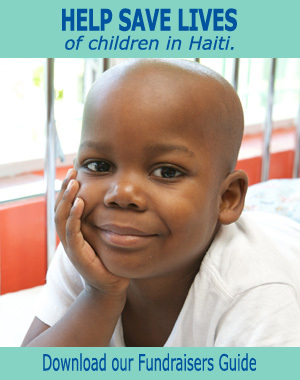 Funded through private contributions to NPH worldwide, St. Damien Pediatric Hospital provides high quality medical treatment for disadvantaged and sick children in Haiti. More than half of all patients are admitted for an infectious disease such as tuberculosis, malaria, and HIV while 25% are admitted for non-infectious diseases such as cancer, cardiovascular disease, and kidney infection. Most patients admitted are also malnourished. The outpatient clinic treats 100 children daily, for acute, parasitic, and bacterial infections. In specialized clinics, chronic conditions such as sickle cell anaemia, congenital heart diseases (CHD), tuberculosis and cancer are treated for months or years if needed. St. Damien Pediatric Hospital and associated public health programs of NPFS reach over 80,000 children annually. Working with Father Rick Frechette, CP, D.O., President of the NPH Haiti Board of Directors, and Dr. Jacqueline Gautier, National Director for St. Damien Pediatric Hospital, NPH USA has created the St. Damien Pediatric Hospital Fund to support the budget necessary to run the hospital and provide support programs to the Haitian community. In a country where 1/3 of the population is under 14-years-old, improvements in pediatric health are a vital and necessary requirement towards Haiti’s economic, social, and political development. St. Damien Pediatric Hospital offers children a place to receive first rate quality and dignified healthcare regardless of their social level. The number of patients that St. Damien has treated has tripled since the devastating 2010 earthquake, an increase of 60,000 children annually. Due to lack of funding, we risk turning away 30,000 children. You can help save the life of a child. To learn more about the St. Damien Pediatric Hospital Fund, please contact Jennifer Rayno at jrayno@nphusa.org. • Profile: Fr. Rick Frechette, CP, D.O.